It is a great application software to import MBOX file to Office 365. This utility provides various unique options to perform the migration process. 1. 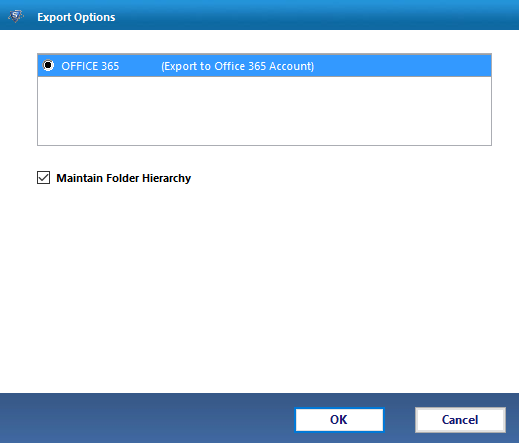 Add File(s): With this option, You can add various .mbox files one by one for their Office 365 migration. 2. Add Folder: Adding a folder is wise option to select because in a single folder you can keep multiple .mbox files. The folder hierarchy of all the mailbox files remains unaltered in the entire process of migration. This particular feature makes the process convenient for a person for the safe movement of MBOX files to Office365. So, the entire process leads to the migration of .mbox file without any data loss. 1. With impersonation: This is the case either you are admin or you have credentials of the admin. 2. 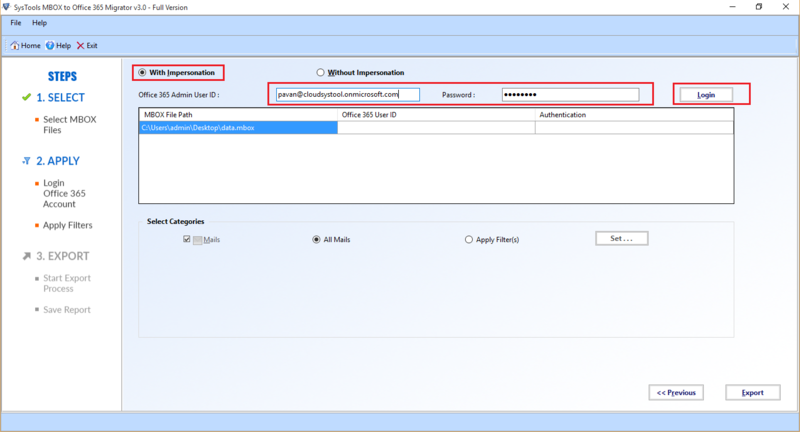 Without impersonation: If you are a normal user with your User ID and Password. Then, You can go with this option. You can easily apply filters on the basis of date with the help of date filters. It would be easy to migrate the data of MBOX files within a particular date range.It is completely avoidable to work on the data that is not required resulting in time saving. 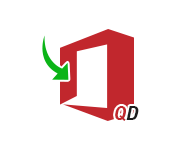 If you have created any sub-folder or sub-directory in the Email Application. Then, that sub-folder will be stored as a folder on local storage with the extension .sbd. So, Along with MBOX file You can add .sbd file as well. MBOX file format is also supported by Thunderbird. If you have MBOX file of Thunderbird then it is a good news for you that you can easily connect Thunderbird to Office 365. Apple Mail is a desktop based email client only runnable on MAC OS. This tool is entirely Windows based. So, you can take the MBOX file of Mac mail from Mac to Windows to import Apple mail to Office 365. Connecting Entourage to O365 is not a time taking process now. You can easily perform the complete process without any difficulty with MBOX to Office 365 Migrator. Why to move MBOX file to Office 365? In the evolving arena of technology, Office 365 has been proved as a boon for all the organizations. Everybody wants to keep the important data on cloud to avoid the loss of data in any situation. Hence, either it is Mailbox file or any other data file, it is always preferable to move the files to Microsoft Office 365. .mbox file extension is not only supported by a particular Email Client, It is supported by multiple email clients including Thunderbird, Apple Mail or Mac Mail, Entourage. 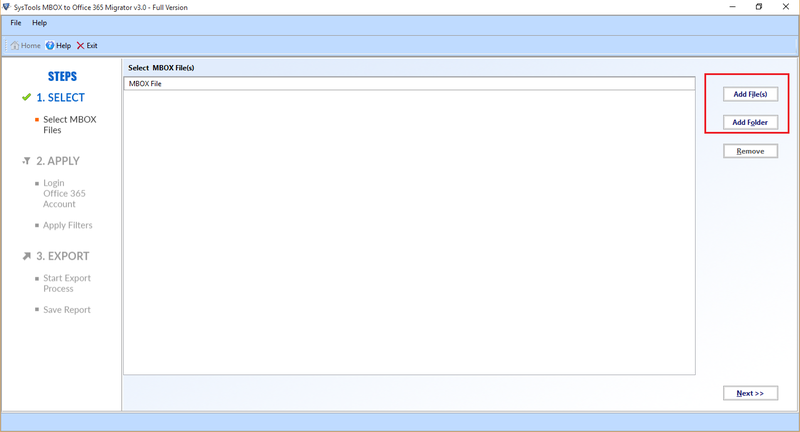 For an example: MBOX to O365 Migrator connecting Thunderbird, Mac Mail and Entourage to Office 365. Free MBOX to Office 365 Migrator tool only allow user to migrate 25 items per folder. Step 1: Open the software.Then,Add files or folder as per your need.Click Next. 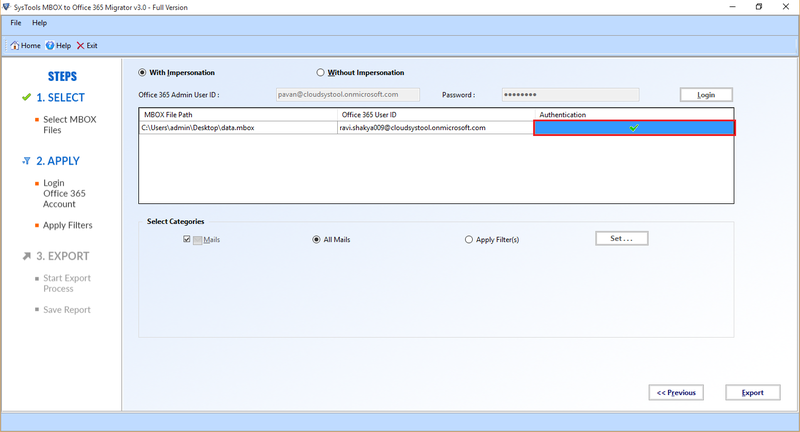 Step 2: Enable the option of Office 365. Click OK. Step 3: Enter the credentials to proceed. You can select a date range by putting on the date filters. Step 4: After getting the authentication cleared, Click on Export. Step 5: You will get notification after the process get completed. Is there any limitation on number and size of MBOX files? No,There is not any limitation of this type. You can easily migrate multiple MBOX files of any size at once. No, The tool is completely Windows based, not runnable on Mac OS. I was Apple Mail user, suddenly I lost access to MAC due to some changes at my workplace. After that I was in need to shift my mailbox to Ofiice365 it was very tough for me to transfer that one. A big thanks to QuickData MBOX to Office 365 that helped me out for the same. Thanks a lot. I have multiple MBOX files, I received from client and It was a task for me to move that mailboxes to Office365 for safety purpose. I was wandering for a solution to this problem. Meanwhile, One of my friends suggested me for this tool. Really a great software for importing MBOX file to Office 365.